Between July-December 2014, Italy takes over the EU Presidency. The Presidency takes place at a crucial moment for the European Union. The EU finds itself in a recovery phase from the economic crisis and the European Parliament and Commission start their new term creating opportunities for a return to the EU founding values of unity, inclusion, human rights and respect. Italy should use this turning point to make social justice and Roma inclusion a priority for their Presidency and ensure that the new European Commission and Parliament keep these issues on the EU policy and political agenda. Investing in Roma inclusion will benefit society as a whole in the long term as it will reduce poverty; contribute to social cohesion and economic growth. 16 July 2014 - A group of Roma camped by a Belgian town faced a rude awakening on Wednesday: the mayor ordered that they be blasted with music to drive them away. The Roma had arrived on Sunday in Landen, some 50 kilometres east of the Belgian capital of Brussels. They agreed with a landowner to park 14 caravans there until Tuesday, according to Landen Mayor Gino Debroux. “Since then, they’ve said they won’t leave and they’re there with 30 caravans,” Debroux told Reuters by telephone. “This is an industrial site and is not designed for camping.” Debroux said the group’s refusal to leave had led him to hire a DJ to play music from Wednesday morning, starting around 9 a.m. The opposition Slovak Democratic and Christian Union (SDKÚ) proposes a set of measures, so-called “small Roma reform”, which its initiators claimed would result in better law enforcement for all and a situation in which it pays to work. Tabled for a fourth time, it failed again to gain passage in parliament on July 9. 10/07/2014 - The growing trend for Gypsy Travellers in Pembrokeshire to continue their education after the age of 16 has been praised at Westminster. 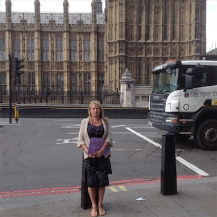 Bev Stephens, Head of the Pembrokeshire Gypsy Traveller Education Service spoke to a committee in the Houses of Parliament in June. She gave evidence to the British-Irish Parliamentary Assembly (BIPA) Committee for Environment and Social Affairs and contributed to an inquiry into Travellers and the Roma population. After a short presentation, the committee questioned Bev about education in the County. As part of a series on Roma Gypsies in Europe, Yuri Maloveriyan of BBC Russian examines how their reputation has changed in modern-day Russia. Russians have traditionally tended to think of Roma (Gypsies) in two ways: as horse-dealers and rustlers, or as rolling stones, wandering around the world in colourful costumes and singing romantic songs. But in the new Russia this old image has been replaced by a different one - one generated by media reports from villages where Roma drug dealers sell heroin. And although pro-Roma organisations try to argue that this picture does not apply to all Roma, their voice is drowned out by the media. "All of a sudden, their houses started to burn because of some electrical problems, and entire clans would leave," remembers Yevgenii Malenkin from Russian non-governmental organisation City Without Drugs, pointing to a burned house not far from Yekaterinburg, in central Russia. “Romania must show a much stronger commitment to effectively protecting the human rights of persons with disabilities, children and Roma”, said Tuesday Nils Muižnieks, the Council of Europe Commissioner for Human Rights, releasing a report on his visit to Romania from 31 March to 4 April 2014. Berlin - Anti-Romani prejudice has been rising in German society in recent years. Negative depictions of Romani people are being ever more frequently exploited by political parties to win votes and, unlike in previous years, such statements are no longer the domain of the ultra-right only. Christine Lüders, Germany's Federal Anti-Discrimination Officer, warned of the trend on 10 July. "For quite some time now antigypsyism has not been a problem of the extreme right only, but a problem of society as a whole," she said. Lüders believes politicians from almost all political parties have been latching on to the topic, as shown by last year's parliamentary elections and this year's EP vote. During those elections, voices in favor of restricting immigration were often justified by claims that most immigrants just want to abuse the German social welfare system. Asparuhovo district in Varna, Bulgaria, was the hardest hit area during the June 2014 floods. The tragedy is enormous; entire streets and houses have vanished. A total of 14 people were killed, including 4 children. I visited the area weeks after the disaster and the scenes remain apocalyptic. Nikolay Nokolov, a survivor of the floods, shared with me his uncertainty about the future: "Half of the roof of my house has fallen apart. The walls of the house are cracked. I received only an order to leave. The municipality offered me social housing but I refused because I have two children and living conditions are very poor." Music Masterclass earmarked at 16 young Romani and non-Romani musicians trained by renowned musicians and singers organized by Sons Croisés and coordinated by Jorge Chaminé, within the framework of Music4ROM : a European project promoting intercultural dialogue through music. Roberto DE BRASOV (France), Ludovit KOVAC (France), Jorge CHAMINE (France). This event is a joint event of Priority Area 10 "Institutional Capacity and Cooperation" of the EUSDR (City of Vienna), Priority Area 9 "People and Skills" (Federal Ministry of Labour, Social Affairs and Consumer Protection, Austria) and the Austrian National Contact Point for Roma Integration (Federal Chancellery, Austria). Participation in the event is free of charge and upon invitation only.